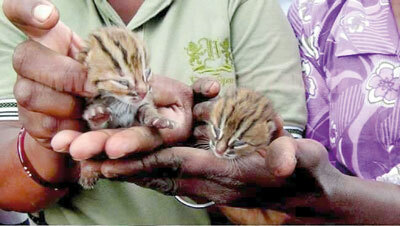 Two wild cat cubs were found in a tree cavity several days ago by workers at the Bogawantalawa tea estate. The mother could not be spotted so the workers carefully took the cubs away, thinking they had been orphaned. 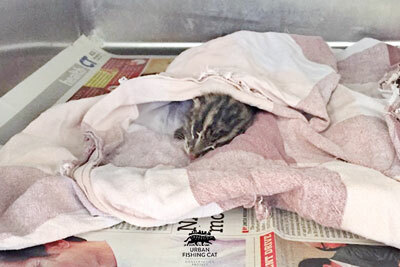 The Nallathanniya Beat Office of Department of Wildlife Conservation (DWC) was alerted to the find on October 4 and rushed to the estate where they found that the cubs were young fishing cats only a few days old. The cubs were in good shape, said wildlife ranger Prabash Karunatilleke. He told the people who found them it was best to take them back to their hiding place because their mother would return for them. “Fishing cats usually hide their babies when they need to go out on brief hunting trips to find food. Perhaps the mother ran away in fright at the approach of the estate workers, but it would have been around,” Mr. Karunatilleke said. Wildlife officers put the babies back in the tree cavity and cleared the area of people. When they returned to the site the next morning the babies were not there. Fresh pug marks around the tree indicated the mother had taken her babies to another hideout, Mr. Karunatilleke said. The wildlife officers had acted sensibly in putting the cubs back in the tree cavity, fishing cat experts said, adding that worried members of the public often believe they are performing an act of kindness in “rescuing” apparently abandoned fishing cat cubs when in fact they were separating babies from their mother. “If you find a fishing cat cub just check the surrounding area for predators. If the cub seems to be safe, just wait and keep your distance as the mother won’t come if it feels your presence,” fishing cat expert Anya Ratnayake said. “If the mother does not appear even after about two hours, then there is a chance that the cubs have been orphaned due to some tragic thing having happened to the mother. “Then, and only then, take the initiative to help them,” Ms. Ratnayake advised. Carnivores are difficult to rehabilitate and be released back to the wild as grown animals, wild cat experts emphasised. It is difficult to teach a baby wild cat the techniques of hunting and other skills that cats need to survive in the wild and which they learn from their mother. 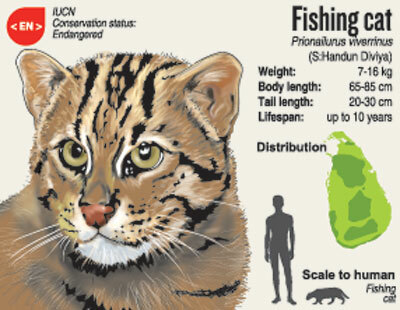 Many fear the fishing cat, known as “handun diviya” in Sinhala. Ms. Ratnayake and fellow young fishing cat expert Ashan Thudugala are doing a good job trying to educate the public about this species. The fishing cat is a medium-sized wild cat that lives in wetlands. They are nocturnal and secretive wild cats so studying them is difficult for researchers. Fishing cats face many kinds of dangers. They adapt to wetlands in busy cities, even in Colombo, so are often run over and killed by accident when trying to cross roads. They are also often caught in snares set primarily for wild boar in many areas. The loss of their wetland habitats is also a major problem. NOTE: Experts opined that the cubs found on Bogawanthalawa are infact the cubs of the Rusty-spotted Cat; world’s smallest wild cat. This entry was posted on October 14, 2018 at 00:39 and is filed under Biodiversity, Community, Conservation, Fishing cat, Wild cats. You can follow any responses to this entry through the RSS 2.0 feed. You can leave a response, or trackback from your own site. It’s good to see that the near endangers species like the fishing cat get equal exposure for conservation by interested parties. The striking coloration of this animal carries with it a unique pattern of natures’ abundant beauty. I’ve observed them play at midnight in my cousin’s estate in Matale’. Slightly bigger in build than a household pet but similar in their curiosity and playfulness. They seem to be robust to sustain habitat loss and assimilate into crowded urban communities surviving on meager food supplies – possibly refuse around cities! Would it be possible to add a hotline here so one would know who to call in case of an emergency. Thanks again for an explicit expose’ on conservational issues.